Face Slayin', Boss Wife & Mom of 2 juggling it ALL! H E Y B E A U T I E S! 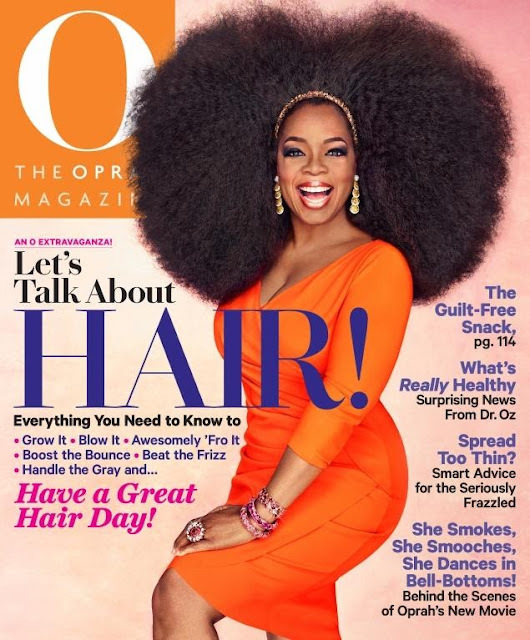 Oprah covers her latest issue of ‘O’ Magazine, captioned ” Let’s Talk About HAIR.” Though this fro-tastic cover is spreading like wild fire with captions like; “OMG, Finally Oprah went natural!” or “This is major for the natural hair community!” I just keep (or kept lol) scrolling by unsure of how I felt. Naturals everywhere are LOVING it and I just feel like the only one that’s…NOT. All I see (thinking like my photographer husband) is a fan blowing teased Brazilian hair and tons of editing to make it look like a fro. But hey…maybe I’m over thinking it. And it says lets talk about hair, not natural hair or black hair. *shrugs shoulders* At the end of the day, do what you want with your hair. I truly don’t care as I’m someone who changes hair styles monthly! One day I was permed, the next I was natural and before you know it I was loc’d. Do you think this an attempt to gain more of a black female audience? Her following consists more-so of middle age caucasian women. Everyone wants a piece of the natural hair community and the buzz/money it brings! Bee Wade is a Professional Makeup Artist & Lifestyle Blogger in Atlanta, GA. In between gracing the faces of everyday women and celebs (Angie Stone, SWV, Avery Sunshine...just to name a few); Bee enjoys sharing her favorite tips and tricks. Building an intimate relationship with her following through her love for beauty & faith. Repair Your Skin Just in Time For Summer | My Skincare Routine + How to Create Your Own! Fenty Beauty is KILLING The Game with These Items! MTY Retreat Experience | Limitless Living w/ Myleik Teele!